For most people when they hear “Card Roulette” they think of the game where after going out for some food and drinks, everyone throws their credit cards into a hat and the first or last card drawn pays for the entire bill while everyone else gets a free meal. Well there is actually a far better version of it and it is available to play at Paddy Power Casino (Not available to Americans, but check out Roulette 5 at WinADay Casino instead.). Card Roulette is a game of Roulette that has the numbers on the roulette wheel replaced by numbers and suits from a deck of cards. There are more numbers on this roulette wheel compared to the other wheels we have come to know and love. Card Roulette has 54 slots for which you can bet on and the ball can land in, 52 numbers and 2 jokers acting as zeros. Since there are more numbers on the wheel, the payouts are a lot better than in a standard game of roulette. Card Roulette also manages to offer players a racetrack for betting on Neighbour bets and all other bets associated with French Roulette just with names applying to a deck of cards. This game uses Playtech software so the speed, sounds, graphics and gameplay of Card Roulette are fantastic. You should really give this game a try as it’s something completely different and you can play Card Roulette at Paddy Power Casino (Not available to Americans, but check out Roulette 5 at WinADay Casino instead.). Paddy Power is only available to players in Europe and the UK so if you happen to live in either of those parts of the world then Paddy Power should be your go to Casino. The amount of Roulette games the have there is just outstanding. Visit Paddy Power Casino (Not available to Americans, but check out Roulette 5 at WinADay Casino instead. ), Download their Casino, Register, claim sign up bonus and then you are ready to play. 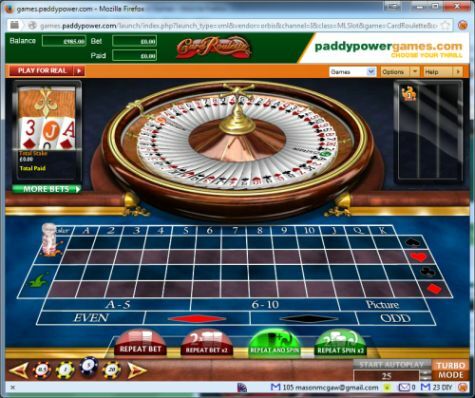 To find this cool Roulette game you will need to find the “Games” tab listed along the top of the main screen of Paddy Power Casino. This is crucial to finding this and many other games as most people go straight to the “Casino” tab. There are many games at both the Casino and Games pages so be sure to check out both for a truly amazing collection of Roulette games. This may look a little different than normal Roulette, but the features are very similar to other version of roulette that you have played. – Under the More Bets option you will find a racetrack to place bets that you would normally find in French Roulette but with names associated with a deck of cards; King’s Court, The Castle, Queen’s Son and many more. As far as the rules for Card Roulette they are the same as any other version of Roulette. Choose your wager amount, and then decide what you would like to bet on and when ready hit spin to begin the round. But in this version of roulette you are placing bets on cards from a standard deck so things get a little different from here on out. All numbers you would find in a deck of card are there; A-10 plus J, Q and K and each is available in any of the four suits. Instead of the outside bets of 1st, 2nd and 3rd 12 the numbers are broken down like this; A-5, 6-10 and picture (face cards; J, Q and K). Also instead of the column bets there are suit bets where you can bet on if the winning number will be a Diamond, Club, Heart or Spade. The usual Red or Black and Odd or Even return for this version of Roulette and the zeroes are replaced with Jokers. A really fun version of Roulette here at Paddy Power Casino (Not available to Americans, but check out Roulette 5 at WinADay Casino instead.) and if you live in the UK or Europe then you have to try this game. Good features for this game and the Turbo mode and autoplay mode just increase the amount of games you can play in a shorter amount of time. Amazing payouts thanks to the extra numbers on the board which make each and every spin that much more exciting. And when you have a good chunk of change riding on a round try and stay seated when there is that much potential winnings spinning around above you. Overall a fantastic game at a great Casino and this game is one of the games I play on a daily basis. Paddy Power Casino (Not available to Americans, but check out Roulette 5 at WinADay Casino instead.) really did an amazing job on this one so head there and have some fun!